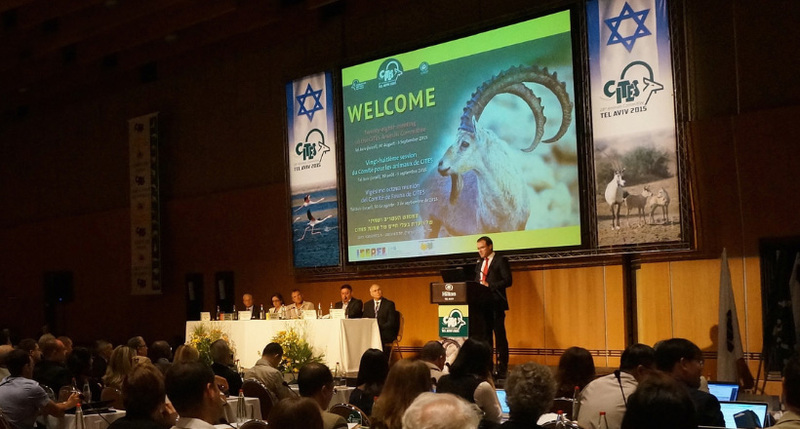 Tel Aviv/Geneva, 4 September 2015 – More than 200 global scientific experts from over 50 countries gathered for the 28th meeting of the Animals Committee of the Convention on International Trade in Endangered Species of Wild Fauna and Flora (CITES) in Tel Aviv, Israel, from 30 August to 3 September 2015. The CITES Animals Committee meeting in Tel Aviv has reviewed trade levels for a wide range of animals that are internationally traded as food products, clothes, skins, traditional medicines, tourist souvenirs and pets ranging from the queen conch to the polar bear, and examined the conservation status on a range of other species, including the African lion. In his comments on the meeting, CITES Secretary General John E. Scanlon stated that “Great progress has been made this week in providing the best possible scientific advice to CITES Parties on a wide range of animals, which will be considered at the 17th meeting of the Conference of the Parties to CITES (CoP17) in Johannesburg, South Africa in a year’s time. We extend our deep gratitude to the Committee members, and to all of the participants, for volunteering their time and expertise to the implementation of CITES." "We are particularly grateful to the Government and the people of Israel for hosting this important and highly productive meeting, and for their warm hospitality and impeccable arrangements," added Scanlon. The Committee agreed on the guidance for CITES Parties for sustainably trading snakes, tortoises and freshwater turtles, sharks and rays, and the queen conch,as well as on improvements to the important CITES Review of Significant Trade process which verifies levels of global commercial trade in species of CITES-listed species over recent years and identifies cases of unsustainable use of species of conservation concern. For those species that are under trade pressure, the Review results in recommendations for actions to address over-exploitation and unsustainable use. The Committee’s Review of Significant Trade concluded that the current level of trade in polar bears, amongst others, is not detrimental to the survival of the species in the wild. However, the Committee agreed to examine more closely concerns about the sustainability of international trade in a number of other species, including pangolins from Africa, birdwing butterflies from Indonesia, medicinal leech from Turkey and several tortoises from West Africa. It also recommended measures on the trade in hippos from Cameroon and long-tailed macaques from Cambodia. With respect to the trade in shark and ray species, the Committee formulated a wide range of recommendations to ensure that better global fisheries management is in place. Kenya and Namibia announced that they would provide the Committee a detailed analysis of trade in African lions, which would help the Committee determine if the species is correctly listed under the CITES Appendices. It examined several other such cases concerning lesser-known species. The Committee discussed traceability systems and techniques for tracking and tracing snake skins, which will also come to the 17th Conference of the Parties. The Committee reviewed proposals to adjust the lists of CITES species or the level of protection afforded to certain species, which may be considered at the 17th meeting of the Conference of the Parties. These include freshwater stingrays and various Asian snakes and proposals from Mexico and Malaysia concerning crocodiles and lizard species. The Committee also looked more closely at the trade management of sturgeons and caviar. The Minister for Environment, Mr. Avi Gabai, and the CITES Management and Scientific Authorities of Israel, which were represented at the highest level during the opening session, reflected the strong commitment of Israel to the effective implementation of the Convention. This was the first time a meeting of a CITES body was held in Israel in the 40+ year history of the Convention. To mark the occasion, the Management Authority of Israel also organized a special symposium on the interface between international and domestic environmental law. The meeting was chaired by the representative on the Committee from the North American region, Ms. Carolina Caceres (Canada). The Animals Committee provides the technical and scientific basis for the implementation of the Convention as far as fauna is concerned, ensuring that CITES decision-making has a sound scientific basis. The outcomes of the 28th meeting of the Animals Committee will be considered at the 66th meeting of the Standing Committee (Geneva, January 2016) and at the upcoming 17th meeting of the Conference of the Parties to CITES, to be held in Johannesburg, South Africa, from 24 September to 5 October 2016. For more information on the 28th meeting of the Animals Committee, please contact Liu Yuan ([email protected]) and Tom De Meulenaer ([email protected]).